This self-lubricating carbide pencil grip glass cutter is made from quality brass. Its substantial weight gives the user a feeling of more control over the score. Textured barrel provides an improved grip while scoring. 1. To hold the glass cutter, place your thumb on the backside of the cutting wheel. 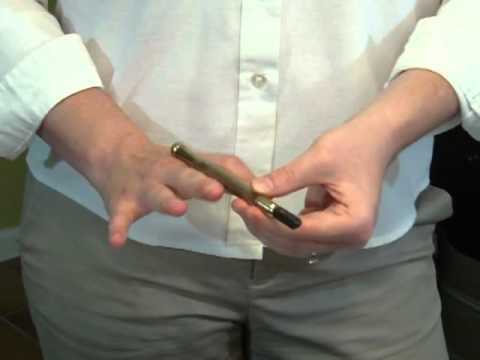 Place your middle and index fingers on the front, similar to holding a pen. Your thumb and fingers should be positioned just above the cutting wheel. 2. For more control place your free hand in the same position. 3. Line up the cutting wheel with the intended score line at a slight downward angle, apply moderate pressure to the cutting wheel and push away. A good score begins at one edge of the glass and runs to the other edge. It should look like a piece of hair on the glass. If it looks like salt, you’ve pressed too hard.